Dozens of Birmingham care workers are planning to travel to Liverpool today (Monday) to lobby delegates attending the Labour Party Conference over the City Council’s plans to cut their hours. Birmingham City Council says it needs to save around £2 million and plans to do this by slashing the hours of care staff working for its enablement service. Under the plans some care staff could see their hours cut from 37 hours to just 14 a week. This would mean that a worker who currently earns around £18,000 a year could lose up to £11,000. UNISON says these changes could take workers below the poverty line, or leave them with no choice but to look elsewhere for work, which could put untold pressure on the service, if lots chose to leave. Birmingham’s enablement service helps the elderly and adults who have been in hospital or are recovering from an illness or injury to relearn skills such as washing, dressing and cooking. Since the cuts in hours proposals were announced at the end of July, hundreds of care workers have been on strike throughout August and September, with further action planned next month. Care workers say the service has already been hit as their colleagues have opted for voluntary redundancy, which has reduced the number of people they are able to look after. They fear planned cuts could result in more staff voting with their feet, leaving the service unable to cope with demand. 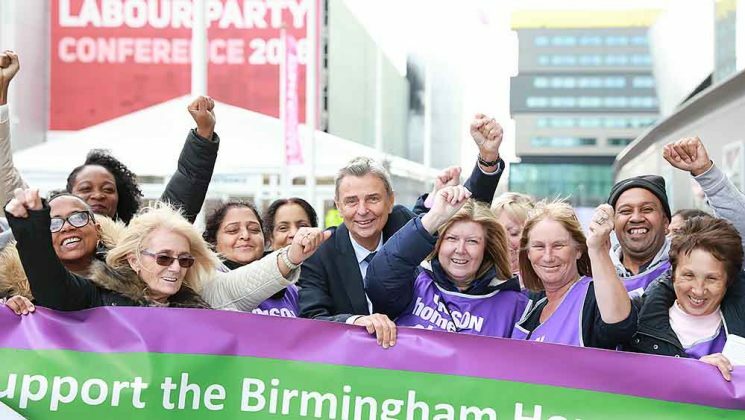 UNISON general secretary Dave Prentis said: “Birmingham City Council seems fixated on cutting costs, while showing little regard for the impact on the many elderly and vulnerable adults across the city who rely on this service. “While local councils everywhere have undoubtedly been hit by government cuts, councillors have made the wrong decision here. They are unfairly picking on hard-working, already low-paid care staff. “Councillors’ plans will either leave staff without enough money for food and bills, or mean they’ve no alternative but to look elsewhere for better paid work. With fewer care staff, elderly people across the city could be left high and dry. 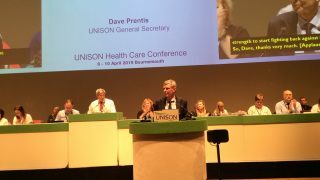 The Birmingham care workers are expected to arrive in Liverpool at around 12.40pm today in time to lobby delegates leaving the conference during the lunchtime break.